Soundtrack Saturday Rewind: "My So-Called Life"
This week, Kelly Stitzel revisits the one — and only — TV edition of Soundtrack Saturday, which featured one of the best shows about teen angst ever to get prematurely canceled, My So-Called Life. In January of 2010, I decided to do something special and different with Soundtrack Saturday: I wrote about a televison series. I had every intention of making this a yearly thing, but, well, that hasn’t happened. That’s not to say it won’t — Soundtrack Saturday is on hiatus, but it hasn’t been permanently canceled. For the first TV edition of Soundtrack Saturday, I decided to write about one of my favorite TV series of all time, one that I knew a lot of other people my age, particularly women, loved, too: My So-Called Life. I’ve gotten quite a few emails in the past two years, from die-hards like me, asking me to repost this, so I just had to give in. If you missed out the first time around, I hope you enjoy. I’ve been kicking around the idea of writing about the soundtrack to My So-Called Life for quite some time, but I kept putting it off because I wasn’t sure if I wanted to take this column into the TV realm. But I think I’m ready to expand Soundtrack Saturday’s scope to give myself — and you, dear readers — a little more variety. I likely won’t be writing about TV shows very often, but I figured I’d give it a shot and see how it goes. When what turned out to be the last episode of My So-Called Life aired almost 17 years ago (I can’t believe it’s been that long), I remember how bummed I was when I heard that it might not be returning for a second season. (The last episode aired January 26, 1995, but the show wasn’t officially canceled by ABC until four months later.) And when I finally heard that it wasn’t coming back, I was devastated. There were no shows like it on TV at the time that portrayed people my age — I was 16 and a junior in high school when it aired — in a realistic way. The characters were believable — they dressed like we did (lots of plaid shirts, combat boots, and floral granny dresses) and even wore the same outfits more than once. They even talked the way we, like, talked. And the story lines covered issues that we were actually dealing with as teenagers in the mid-’90s. 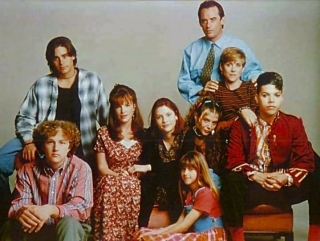 For those of you who’ve never seen My So-Called Life, it centers on 15-year-old Angela Chase (Claire Danes) and her trials and tribulations with her parents, Patty (Bess Armstrong) and Graham (Tom Irwin); her younger sister, Danielle (Lisa Wilhoit); her friends — rebellious Rayanne Graff (A.J. Langer), flamboyant Rickie Vasquez (Wilson Cruz), do-gooder Sharon Cherski (Devon Odessa), and nerdy Brian Krakow (Devon Gummersall); and, last but not least, boys. Well, one boy in particular — the infamous Jordan Catalano (Jared Leto). While I did watch the show on ABC during its one-and-only season, I also obsessively watched the reruns on MTV. I even stayed up all night once during my freshman year of college to watch a marathon of the entire series. I connected to it on so many levels and related to many of the characters, particularly Angela (even though I never had a Jordan Catalano to contend with). I don’t think a TV show had ever affected me like that before, and I know a lot of my friends who are also fans of it would say the same. One element of My So-Called Life that I’ve always loved is its use of music and the integral part it plays in many episodes (19 were produced in all). For example, I can’t imagine any other song besides R.E.M.’s “Everybody Hurts” playing at the end of the pilot. The Grateful Dead is the perfect band to act as a bridge between Angela, her father, and Rayanne in the fourth installment. And episode seven gives us our first taste of Leto’s musical abilities when Jordan sings a song that Angela thinks is about her. Fans of the show will remember Buffalo Tom, as themselves, performing at a club in episode 12. An entire episode focuses on Jordan’s band, Frozen Embryos, and Rayanne’s desire to join so she can reconnect and spend more time with Angela (we get to hear Leto sing again; this time it’s a cover of the Ramones’ “I Wanna Be Sedated”). And then there’s Juliana Hatfield’s appearance as an angel in the Christmas episode, performing one of my favorite songs of hers, “Make It Home.” Plus, Angela’s I’m-over-Jordan-Catalano dance, set to Violent Femmes’ “Blister in the Sun,” is something a lot of us girls can relate to (“It’s such a relief to finally have my life back!”). , you can now watch episodes on Hulu, Netflix Instant Watch or on the Sundance Channel. TLC – What About Your Friends?